Dragan Golijanin, MD is the Director of Genitourinary Oncology section at Rhode Island and Miriam Hospitals of Brown University in Providence, Rhode Island and Assistant Professor of Surgery (Urology) at Brown University. Dr. Golijanin completed his medical school at University of Belgrade in 1984. He completed urology residency at University of Belgrade and Hadassah University Hospital in Jerusalem, Hebrew University. This was followed by fellowship training in genitourinary oncology and molecular biology research at Memorial Sloan-Kettering Cancer Center and Cornell University, Weill Medical School in New York. He joined University of Rochester in 2003. Dr. Golijanin acquired his Board Certification in Urology by the American Board of Urology in 2011. Since 2009 he worked as an attending and GU oncologist at Strong Memorial Hospital of University of Rochester, NY. 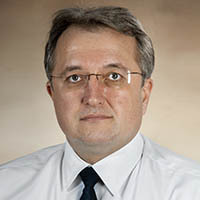 Since 2011 Dr. Golijanin is Director of Genitourinary oncology section at Urology division, department of surgery, at Rhode Island and Miriam hospitals. Dr. Golijanin is board-certified in urology by the American Board of Urology. He has received several awards: Prestigious Donsky Foundation Award in Jerusalem, Israel in 1995 as well as Murphy Scholar award in 2007. He is listed as one of the Best Doctors in America. He is reviewer for several urology journals, including Urology, Journal of Urology and editor for Frontiers in genitourinary oncology. His clinical and research focus is the treatment of patients with cancers of prostate, bladder, kidney and testis. He has published over 55 articles in peer-reviewed journals since 1995 on issues related to prostate, bladder, kidney and testis cancer. His current research focus is on the development of imaging modalities using near infrared fluorescence, as well as, targeted imaging using different coupled antibodies and coupled specific inhibitors of different tumor and normal cells. These imaging modalities were developed in the last 8 years: pioneering work in imaging of prostate and renal cell carcinomas as well as bladder cancer, imaging of lymph nodes and tumors real time, intraoperatively assessing tumor’s location and spread. He was the first to publish on near infrared imaging in open, laparoscopic and robotic surgery real time. Dr. Golijanin continues his research with Dr. Thomas Webster of Brown University including his colleagues from Urology division, as well as from Pathology and Oncology. He also continues with work on outcome analyses in bladder and renal cancer. Clinically Dr. Golijanin is Co-director with Dr. A. Mega of Urologic Oncology Multidisciplinary Clinic at Miriam Hospital. Dr. Golijanin performs robotic laparoscopic and endoscopic surgery at Miriam hospital and open oncological procedures at Rhode Island hospital.